The fossil was collected in Trets - near Aix En Provence in France - and dates from the Cretaceous - approximately 68 Million Years Ago. 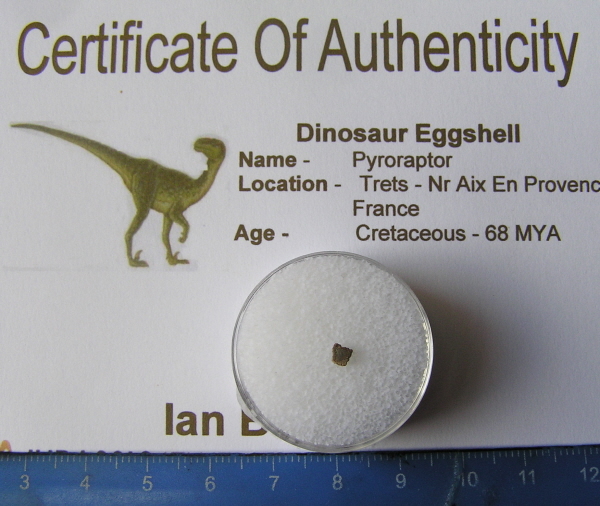 This is a more rare fossil to find and this is the first I have ever offered in nearly 9 years of selling fossils on Ebay. The piece of shell measures 2mm across. This NOT a large piece of eggshell. I would hate for anyone to buy this and receive it and expect it to be huge. This is VERY rare material, but is not huge.